The only holiday record I've found so far is a compilation of organ and chime tunes. So-so. 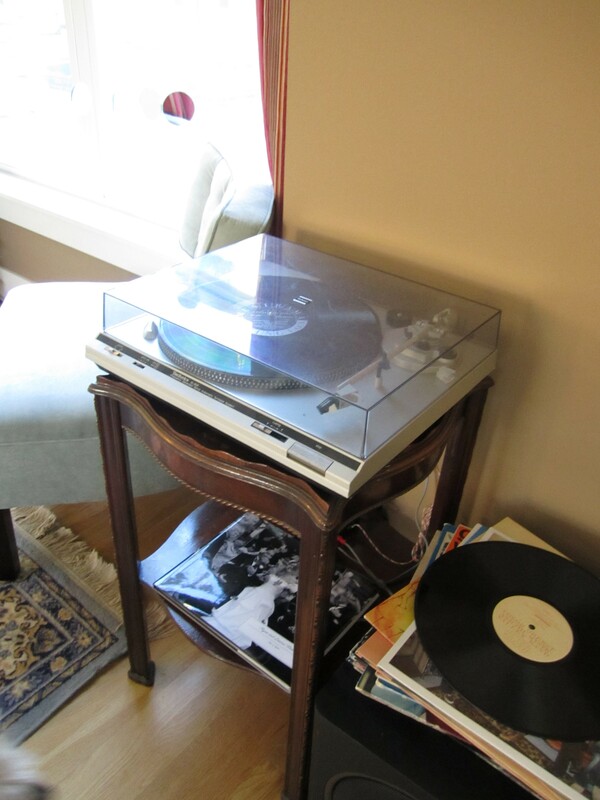 … but I accidentally call mine a record player most of the time. Ryan got me this stellar Technics SL B-20 for my birthday this summer, so I’ve been on a quest for good records ever since. I don’t know why people love when I turn it on at a party, or why a Friday night at home with a bottle of wine is so much more of an event when the record player is on, but it’s true. I am in LOVE with my record player. If you need your own turn table, you can check out Craigslist or maybe a second-hand shop, but one place that’s really reliable (if you don’t mind crabby service — really it’s part of the charm) is Play it Again, Sam, on Madison in Lakewood. 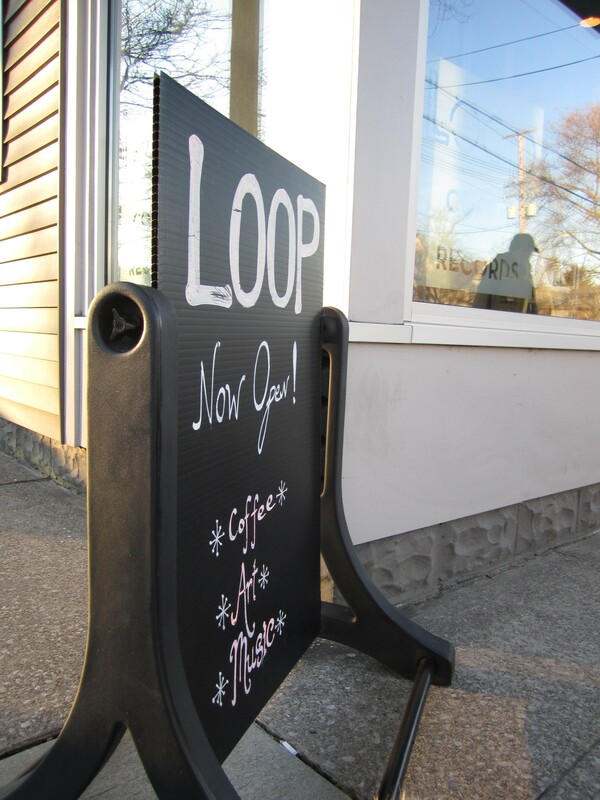 Loop on W. 11th in Tremont is my favorite. I’m partial because I can walk there, but there’s so much more to it. Loop is decieving. It appears to be a glassy, modern coffee shop with friendly employees and a few CD’s in the back. The first few times I stepped inside, I thought it might be a good place to grade papers (I’m always looking for a new spot). It wasn’t until I walked by on a summer day and noticed the crates of records outside and stopped to talk to the owner that I learned that the ENTIRE UPSTAIRS of the shop is filled with records. They have some used material, but it’s mostly new. There are three things I love about this store: 1) They have several good turn tables upstairs, and customers can test out merchandise. 2) They sell some of their used records for $1. 3) (And this is why I like the store the most), one of the employees, obviously a musical genius of the “High Fidelity” variety, places sticky notes on interesting choices with tiny gems of information about the music in the cover. It’s like getting a mix tape with a list of why the songs were chosen. And this is why I have a crush on Loop. Phonographic Arts is the dorm room of record stores. It is tiny, but its prices are perfect — I recently got a 10 percent discount and my purchase totalled 94 cents. The owner/employees will gladly throw something you’re interested in on the turn table for test drive, and you can find a crazily eclectic variety of music here. The choices are limited in quantity, but it makes for GREAT (and quick) browsing. Also, Visible Voice Books is next door, and, these days, it’s hard to find a real indie bookstore. My other favorite, on Madison in Lakewood, is called My Mind’s Eye. This is probably the best place to go if you know what you want. It’s the only place where I can consistantly find exactly what I’m looking for (though Loop has good selection, and they’re happy to order). The other day I was on my way to Angelo’s, and I stopped by to pick up some Blind Willie Johnson to play in my multicultural lit class the next day. Of course, they had it in stock. The employees are generally really helpful, and I never walk out of there without something (ie: She & Him, Tom Petty, Monsters of Folk) in my happy, happy hands. I’ve been collecting records too! Jamies flea market is awesome for finding $1 records as well as 1/2 price book store in westlake! I have 100 records so far and am waiting for my record player under the Christmas tree! haha, jamies flea market. they also have an excellent selection of vintage gi joe toys. Holy crap, that’s a lot of records! I only have about 15.